Txakolina is an exception to the way this site is organized, which is normally by grape type; we considered various ways to address the topic, but amalgamating it all under this one umbrella seemed the most satisfactory (or, to be honest, least unsatisfactory). The difficulty arises from Txakolina being a rather distinctive wine type, but one that can be made of any or several of a collection of unrelated grape types. What Txakolina wines—which can be white (nowadays the most common), rosé, or red (formerly the regional norm)—have in common is a distinctively high acidity, fairly low alcohol content, light body, moderate to pronounced pétillance (effervescence), decided minerality, and (usually) strong flavors. It is a type quite specific to its origins in Basque country, though today there is also a very small amount produced in Chile. The nomenclature associated with Txakolina wines can get complex, and touchy: the latter because there are strong feelings about the differences between native Basque renditions of terms and the Spanish renditions of those terms (that applies to far more than just wines, and derives from the centuries-long friction between the Basque community and the government of Spain, which at times has sought to erode native Basque traditions and language). 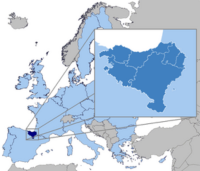 And that isn't all: even in the laws regulating the three DO (Denominación de Origen) Txakolina regions, the name of the most notable wine grape is spelled (all in Basque, mind) in three different ways. We will try to cut across most of this needless complexity and address the wines themselves, but will try to use the varietal-name spellings appropriate to the DO in which that type dominates. Note also that Txokalina itself is often rendered instead as just "Txakoli" (don't ask); apparently either form will do. First, what are the wines that can go into a Txakolina? The foremost these days is a white grape that DNA evidence says is identical to the Courbu Blanc grape of France; note that that is not the same grape as the more famed Petit Courbu of Gascony, but it is said that wines from the Courbu Blanc are quite similar to those from Petit Courbu. The Basque version is called by slightly differing names in each of the three Txakolina DOs; it is variously "Hondarrabi Zuri" (in the Getariako Txakolina DO), "Hondarribi Zuri" (in the de Álava Txakolina DO), and "Ondarrabi Zuri" in the Bizkaiko Txakolina DO). And just to ice the cake, Zuri is also often spelled as "Zurri" (or even sometimes "Zuria"). Many online sources do not use these various forms in accordance with their true provenance, so you may expect to find any spelling whatever in an article on Txakolina wines. The wines from this grape are described as pale yellow with aromas of citrus fruit, ripe fruit, herbs, and flowers. Txakolina wines that are 100% Hondarrabi Zuri can readily be found, as well as blends starring the type. Note that though the grape is usually styled as just presented, technically it is "Hondarrabi Zuri Zalla"; the Petit Courbu grape is, in Basque nomenclature, "Hondarrabi Zuri Zerratia". Taking notes? Another important grape type, and the only one that seems to be unique to the Basque region, is the red-wine grape Hondarrabi Beltza (aka Ondarrabi Beltza). Despite the name similarities, this grape is quite unrelated to the white grape Hondarribi Zuri. The variously spelled Hondarrabi/Ondarrabi is a jumbling of the name of a small town in the region, Fuenterrabia (in Basque, "Hondarribia", which means "sand ford") on the Bidasoa River, which is very near the border between Spain and France. And Zuri is just Basque for "white", while Beltza is Basque for "black". See? Not so arcane after all. At any rate, Hondarrabi Beltza makes all the red Txakolina, is the informing grape in rosé (rosado) Txakolina wines, and can even be found in small amounts in some white Txakolina wines. 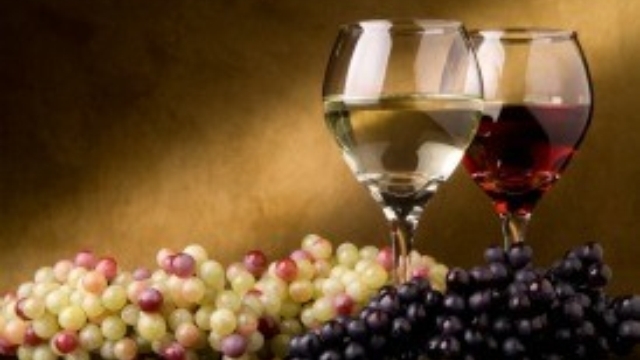 Like the other grapes used in Txakolina wines, it is marked by assertive acidity. Its flavor tends markedly toward strawberry and perhaps even more raspberry (well suiting it for rosadas). Broadly speaking, the takeaway from all this is that Txakolina is a very interesting and usually delightful class of wines, good on their own or with food. Many sites, even the official ones, tend to minimize the class, referring to them as "simple"—apéritif wines or "summer wines"—but the best of them have more than enough character to be taken seriously, and to go with foods of all sorts. By law (meaning some makers might be cheating), Txakolina is never artificially carbonated: the residual carbon dioxide gas from fermentation is simply retained in the bottling. Some few Txakolina wines are made as still wines, but most deliberately preserve the effervescent quality. Factoid: Txakolina wines are served, in what purports to be an old ritual form, by being poured into the glass from a substantial height, from a foot or so up to four feet or thereabouts (depending on the server's sense of showmanship); a special bottle (a porron) is often used. The process supposedly augments the pétillance of the wine (though it seems to us that it would also augment spillage and waste). Despite the showmanship, one writer dryly notes that "If you visit the vineyards there, vintners will show how the Basques drink the popular wine, pouring it from a height into flat-bottomed tumblers. This aerates the wine and gives it the slightest prickly fizz, making it even more refreshing. The key is to pour it from 10 to 12 inches above the glass, not more, so you get a little bit of foam, but not too much." Or as a retailer puts it, "This has more to do with aerating very rustic, reduced wine served off lees direct from casks behind the bar, and has little relevance to filtered, bottled wines." One last note: it surpasses understanding why so many wine writers whine (however playfully) about the supposed impossibility of ever pronouncing the Basque wine names. Most of the "problem" dissipates when once one grasps the simple fact that "x" is used to represent the sound "ch" as pronounced in English "cheer". The occasional use of a "t" before it is almost immaterial: the difference between "cha" and "tcha", if there is any such difference. There: wasn't that easy? "[A] family of slightly sparkling, very dry wines with high acidity and low alcohol content produced in the Spanish provinces of the Basque Country, Cantabria and northern Burgos. . . They are normally served as aperitifs and drunk within one year of bottling as they cannot be stored for longer. The most common variety, white, has a pale green colour, but there are red and rosé varieties." "The fresh, lightly fizzy wine made in the Getaria region of northern Spain — the appellation is Getariako Txakolina — is the most familiar expression, but other Txakolinas are made as well, all worth exploring. In the neighboring appellation of Bizkaiko Txakolina, centered on Bilbao, the wines are less fizzy and a bit fuller and rounder. Bizkaiko Txakolina has many variations, even a little bit of delicious red . . . A third, tiny appellation, Arabako Txakolina, was established in 2003 in the inland region around Álava. . . [T]he grapes are hand-harvested and delivered to the winery, where they are immediately chilled down nearly to freezing and blanketed with nitrogen, an inert gas that prevents oxidation, a process that preserves freshness, juiciness and tangy acidity. The wines are then fermented with native yeasts in steel tanks, also kept cold and blanketed to capture carbon dioxide, which accounts for the fizziness. The carbonation is entirely natural, though it is widely suspected that less scrupulous Txakolina producers illegally inject their wines with carbon dioxide. " "In general Txakoli is clean, high in acid, and has a great deal of minerality and salinity, making it perfectly refreshing to sip with seafood, cured meats, and hard cheeses like the Basque-made sheep's milk cheese idiazabal. It's a knockout with fried snacks as well, and since it's low in alcohol, this wine is ideal for sipping all afternoon (and all night) over plate after plate of tapas. " "Txakolí is typically light-colored, with a slightly green tinge and tiny little bubbles that stream to the top of the glass. Its flavor holds a slightly herbaceous and citric quality that I find exceptionally refreshing among white summer wines. 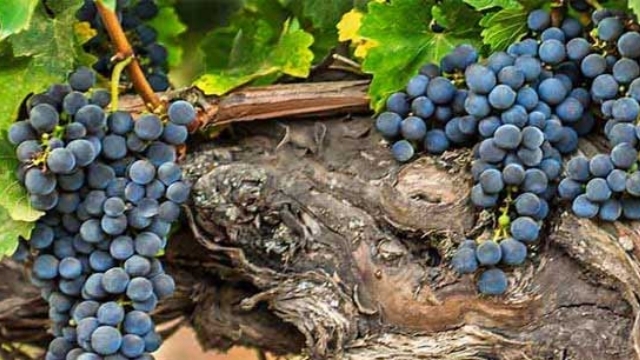 The indigenous Spanish grapes Hondarribi Zuria and Hondarribi Beltza are the main varieties, giving Txakolí its particularly refreshing acidity and kick. There is a slight variety in styles depending on where in the Txakolina region the wine comes from (central wines are rounder; coastal wines are zestier), but they are all essentially refreshing bottles that pair well with most foods." "That means fresh, sometimes even tart whites, often bottled with a little spritz, and much rarer but similarly lean reds. . . The wines still retain that green apple and lemon snap, and often still a little CO2. They are served locally in chunky tumblers just as they always were, but quality has risen steeply." 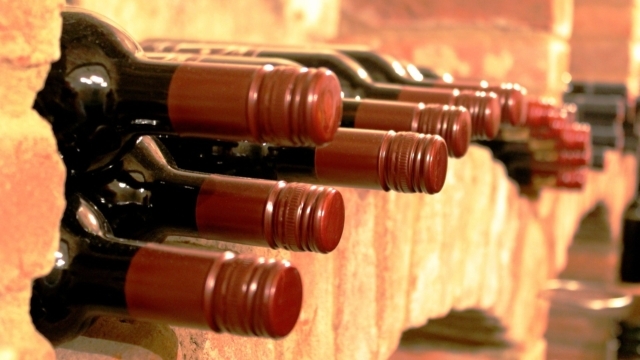 "This wine is straightforward and uncomplicated. It has a refreshing style with fruit-dominated characters, and can have a slight sparkle as well as high acidity." "Color: Almost clear and spritzy with small bubbles because they ferment the wine under really cold temperatures and wind up with a blanket of carbon dioxide over it that makes it fizzy. Smell: Fresh, like flowers, unripe peaches, and light apple. It smelled like a waterfall and then had a spicy warm rock smell to it too (if you’ve been hiking, imagine sitting on a rock face in the sun — that spicy rock smell is what this was like). Taste: Like sucking on a salted lemon. It was very tart with high acid and it tasted like lemon salt water. The wine was spritzy and reminded me of a more tart version of Vinho Verde." "Die-hard red wine drinkers, though, are often at a disadvantage [in the summer], casting around for something — anything — to slake their thirst. If anyone's asking, I might steer them toward Spain and a crisp, bone-dry, slightly saline Txakoli (a.k.a. Txakolina) from the Basque country on the northern coast of Spain. And since Txakoli is generally low in alcohol, it's the perfect summer wine." "The wines have been characterized as the ideal summer sippers, but are also perfect for the colder months and holiday time. Gentle effervescence suggests the celebratory vibe of bubbly, low alcohol means you can sip throughout the length of a party without getting sloppy and razor-sharp acidity is a great pairing for a good many finger foods, from hard cheeses to raw oysters to salty, deep-fried bites. I keep calling the wines “fizzy” because this is the style I like best: dry, mineral to the point of being nearly salty, zesty and laced with tiny, fleeting bubbles (they disappear if you let your txakoli sit out too long – which is why small, frequent pours is how this wine should be served). This fizzy, saline, high-acidity style is best associated with Getaria, the smallest subregion of txakoli-producing Basque Country. The other two regions, Bizkaia and Alava, make a slightly lusher, rounder txakoli. 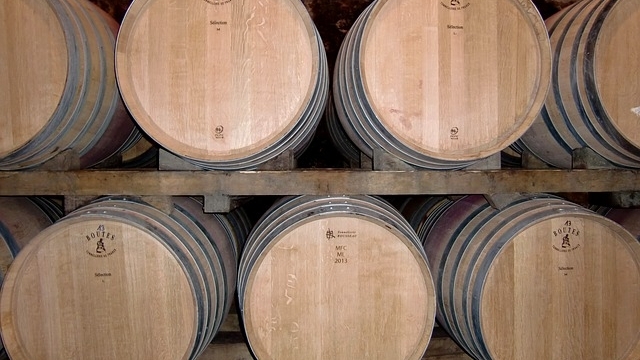 A few wineries even make red txakoli." "At their best these wines can be as scintillating, refreshing and bracing as a walk along the seashore. They are light-bodied, have high acidity and tend to be light in alcohol, around 10.5%-11%, with green apple characters and even a trace of a salty tang and a slight spritz that makes them wonderful as an aperitif or with a salad, seafood and virtually any alfresco meal including, traditionally olives and anchovies." Now that Txakolina wines are suddenly fashionable in the U.S., prices have elevated correspondingly: these are no longer "cheap" wines, though they are still very reasonable in an absolute sense. We repeat that the frequent dismissive descriptions of these wines as "simple" does them an injustice: not a few are as "complex" as many substantially more "respected" wine types, and are certainly as pleasing. The Txakolina market nowadays is mostly white, but we have also included a red; the rosado Txakolinas are several and generally good, but we treat them with other Rosé wines, not here. But, from the literature, it looks like you are not likely to go far wrong with any Txakolina you might find, so don't hesitate to experiment. ♣ Beware: many merchants fail to distinguish in their offerings between the Blanco (white) and the Tinto (red) bottlings under the "Doniene Gorrondona Txakoli" label. Make sure you know which you reading about (or ordering). ♦ Color: Almost clear and spritzy with small bubbles because they ferment the wine under really cold temperatures and wind up with a blanket of carbon dioxide over it that makes it fizzy. Smell: Fresh, like flowers, unripe peaches, and light apple. It smelled like a waterfall and then had a spicy warm rock smell to it too (if you’ve been hiking, imagine sitting on a rock face in the sun — that spicy rock smell is what this was like). Taste: Like sucking on a salted lemon. It was very tart with high acid and it tasted like lemon salt water. The wine was spritzy and reminded me of a more tart version of Vinho Verde. I really liked how fresh the wine tasted and the saltiness would have gone perfectly with fish or salty nuts like cashews or Marcona almonds. I completely respect that the Basques have it with every meal — from fish to heavy meat to vegetables — but for me it’s not a wine for everyday. That said, for fish or seafood, I’ll choose it any day. It’s a great alternative to Albariño, a light style Verdejo, and Vinho Verde. ♦ A seventh-generation producer, Ameztoi is one of the best-known producers in the region, and for good reason. The wines are consistently good and never veer away from what people have come to expect from Txakolina. With bracing acidity, lemon-lime and a green apple tartness, this is the wine to track down if you have never tried Txakolina before. ♦ His Getariako Txakolina is a blend of Hondarribi Zurri, a white grape, and Hondarribi Beltza, a red varietal. Soft-pressed and fermented in stainless steel tanks, the bouquet is reminiscent of green apples and fresh limes dusted with sea salt and finished with mint. A light, crisp palate and a slight, natural carbonation make this the perfect wine for seafood dishes. ♦ Light straw yellow in color with noticeable petillance. At first sniff, this wine exudes heavy duty 'mineral water' minerality. As it warms, scents of green apple, fresh pear and citrus evolve. In the mouth, this wine is light-bodied and crisp. It offers simple flavors paired to a surprisingly complex mouthfeel. Ameztoi begins as a bracing, dry wine, but finishes with a rich, creamy texture. Both tasty and interesting. ♦ Pale yellow color with tiny bubbles, clear hue, pretty floral and apple aromas and tastes, mineral notes, slight fizziness, great acidity, short finish. ♦ [T]his light, crisp wine is fermented in stainless steel and bottled with residual carbonic gas that gives the wine its signature natural spritz and effervescence. It’s zesty, fresh and eminently quaffable with bright, briny sea salt notes combined with limey fruits. ♦ The Ameztoi Getariako is clean, crisp, super dry and minerally, with some notes of tart Granny Smith apples, citrus peel. ♦ The top white vote-getter is the 2012 Getariako Txakolina from Ameztoi in Gipuzkos, Spain. . . This low alcohol white is super intense with crisp acidity and pure lime. We thought the thirst-quenching, spritzy quality to this wine would match best with lightly grilled fresh oysters and it would cut through fatty charred red meats. ♣ A blend: 70% is Hondarribi Zuri (Courbu Blanc); the other 30% is a blend of Izkiriota (Gros Manseng), Izkiriota Ttippia (Petit Manseng), and Hondarribi Zuri Zerratia (Petit Courbu), with the exact proportions unspecified by the maker. ♦ Honey drops on green apples and wet stones make for an appealing aroma, but the flavor is all green apple and spice. This has lower acidity than normal racy Txakolis, but it's still a tart drink. ♦ If you like Albariño you’ll like this wine. Light, upbeat and yes, charming, this is a wonderful warm weather wine. Xarmant Txakolina has an aromatic and floral nose, with crisp flavors of pink grapefruit, lime and apple. The finish is dry and refreshing with just a hint of spice. Light yellow. Impressively complex bouquet of grapefruit, lemon thyme, tarragon and white pepper. Dry, racy and sharply focused, offering lively citrus and green apple flavors and a strong herbal note. Finishes with impressive clarity and mineral thrust, with the herbal element recurring. ♦ [T]his wine from the Basque country is almost glaringly bright, with green apple and lemon-lime fruit that is tart but not sour. ♦ This producer's flagship txakoli is pretty and balanced, dangerously drinkable. ♦ [A] wild and refreshing blend of citrus, mineral and spice elements, along with a strong floral quality. ♦ Lovely, light and delicious. ♦ Arabako Txakolina, founded in 2003, is the youngest Txakoli DO. Nestled in Spain's Basque Country, it is farther from the sea than any other Txakoli DO. The entire DO encompasses a total of 60 Hectares and has only one producer, a cooperative between 12 growers that pool their resources together to create Xarmant Txakoli. Xarmant, which means Charming in French, though spelled in the Basque way (they sure love them 'x's) is located at a higher elevation and abuts the Castilla y Leon region in Northern Spain. This climate is a great mixture of continental and oceanic influences that create ripe yet nuanced fruit that is distinctively different from the Txakolina DOC. This stainless steel fermented wine has a light crisp effervescence with lemon lime zest, a nervy acidity with a slight saline finish. ♦ This is my favorite of all the txakolis I tried. The fizz, fresh citrus and melon flavors, and a salty minerality get your mouth watering. ♦ This, although Spanish, is essentially a ‘green wine’, vinho verde in Portuguese, in which the grapes are picked when still high in malic acid . . . But it absolutely has to be a good example. If there’s a shortage of fruit, the wine is like paint stripper. In my experience the best producer is Txomin Etxaniz (another good friend of mine) who, despite labels which suggest they belong to another decade, manage to squeeze an admirable amount of flavour and even a suggestion of floral aroma into their bottles of wine which are, mercifully, just 10.5 per cent alcohol. ♦ The big production wine for this estate has a lovely yeasty, herby nose, very delicate with a light lemony flavour. On the palate the faintest sparkle, but a really fresh, with lots of lemony fruit and real vibrant punch. Light and tangy, with those faint herbal flavours adding a lovely complexity. 89 points. ♦ The 2012 Txomin Extaniz white version shows a dramatically different styled wine, but equally unique inside its Txakolina peer group. While the rosé aromatics are whispy, citric, and clean the white version shows off richness and viscosity at first sniff. Pineapple and peach aromas and flavors add to equally bracing citric acidity, but the wine has a rich malic character that I had not experienced in Txakolina before. It loses the lightness and simple fun of Txakoli, and exchanges it for more serious wine characteristics. It’s a lovely wine in itself, but the rosé stands on a taller global pedestal and is completely remarkable. ♦ The 2009 Txomin Etxaniz is fresh and tangy, with a slightly chalky mineral and lemon flavor. It goes beautifully with the ubiquitous Basque snacks of anchovies and preserved tuna. . . The crisp, refreshing archetype. ♦ [T]his is one cool wine: fragrant nose that's mineral, citrus and some sweet white flower, and chalky minerals on the palate with fruity lemon juice up front and a dry orange zest finish. Lots of body, but it's not a heavy wine. Another thing we enjoyed was that it kept changing--every glass seemed a little different from the last. ♦ This is an animated, slightly fizzy wine with green apple, citrus and mineral aromas and flavors and vivid acidity. It evokes a sense of salty sea breezes and sandy beaches. ♦ The freshest, crunchiest wine here. Serve it cold, poured from a height into a tumbler or wine glass. A vivid shot of the nervy north coast, made for the freshest of shellfish. 88 points. ♦ I was happy to finally get to taste what top txakoli is all about. It is, I have to say, very pleasant and very well made. Bright acidity, lovely lemon-citrus flavors, refreshing, bone-dry, with a touch of yeast and a neat, pleasant mineral backbone. The fizz is best revealed when you pour the wine from a little high above your glass: the wine then fills with the tiniest of bubbles, and leaves a white ring on its edge, showing the persistence of the carbonic gas in the txakoli. . There is a fashion surrounding txakoli, right now, in the United States, and I’m very happy for the producers who are getting a very good price for their wine. But at over 25$, txakoli will be a very occasional buy, for me, even the excellent Txomin Etxaniz, which was impeccable and precise, and pretty much perfect, for what it is supposed to be. Under 20$, you’d probably see me buying by the case. There are no splurge-level white Txakolinas: the ones above are about as good as it gets. If you want to pop a little extra for a "splurge" red Txakolina, it's Hobson's Choice: the Doniene "Gorrondona" Txakoli Tinto.